Tech Center: Sharpie Liquid Pencil is a Pencil..no a Pen..no a Marker. What? Sharpie Liquid Pencil is a Pencil..no a Pen..no a Marker. What? When it comes to stationary Pens and Pencils are the most basic things we need to write. Pens have their own advantage and disadvantages so do Pencils. But how about having something to write with, that only has the advantages of both of them. That's what popular stationary manufacturer Sharpie has recently come up with. Although we have similar products in the past, but Sharpie Liquid Pencil has a lot more to offer. 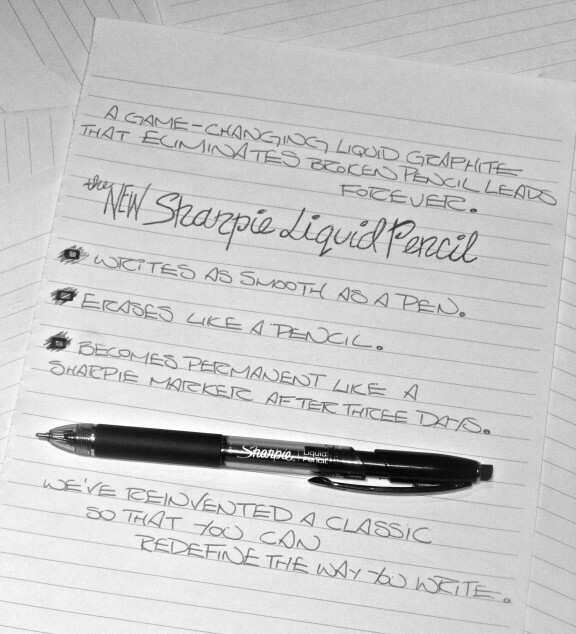 The Liquid Pencil works on what is called liquid graphite so you have the kind of fluidity and smoothness. Looks, feels and works just like a pen. Works smooth, forget sharpening and irritating breaking leads. Erasable with normal eraser just like a pencil. On the official blog its mentioned it will be available from September 2010. But wait its already available on Sale at officedepot.com for $4.99 which includes Opaque Black Barrels, Black Lead, Pack Of 2 + 6 Erasers. So there you have it, the Sharpie Liquid Pencil! !